The Homeowners form provides limited property coverage for watercraft. 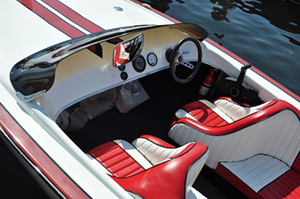 Physical Damage coverage for the boat, motor and miscellaneous equipment may be added to the basic Homeowner, Tenant or Condominium policy subject to certain restrictions. Watercraft up to 26 feet long powered by outboard engines or motors exceeding 25 horsepower. Watercraft powered by inboard or inboard-outdrive engines or motors. Sailboats 26 feet or longer; with or without auxiliary power.